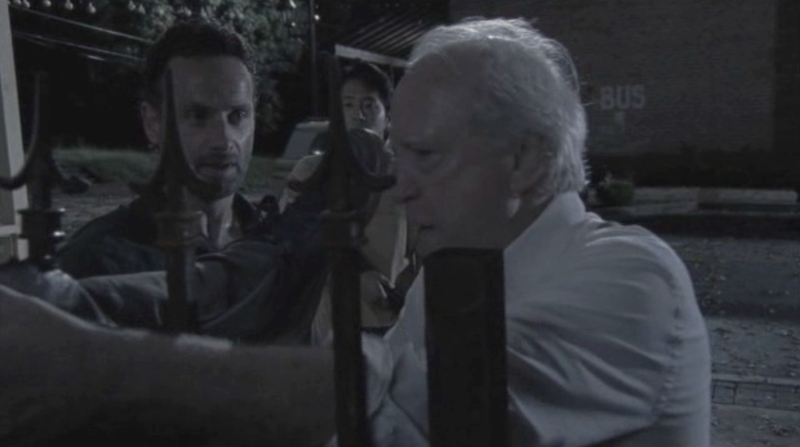 Hershel Greene, a wise older veterinarian, first met the Atlanta Survivor Group when Rick arrived carrying a gravely injured Carl. 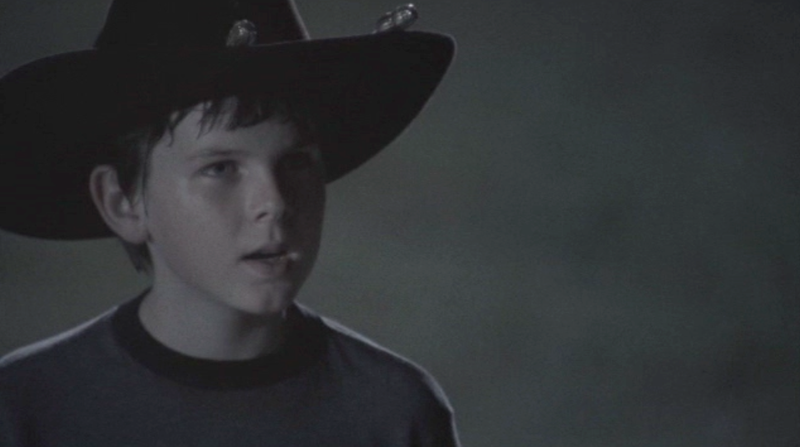 Hershel willingly aided Carl and allowed the Group to form a makeshift camp on his farm. Although he was polite to his guests, his position of not letting them get too comfortable remained clear. Upon Carl's recovery and Sophia's return, he wanted them to leave. He did not even want his daughters to talk to the Group and preferred everyone to keep their distance. 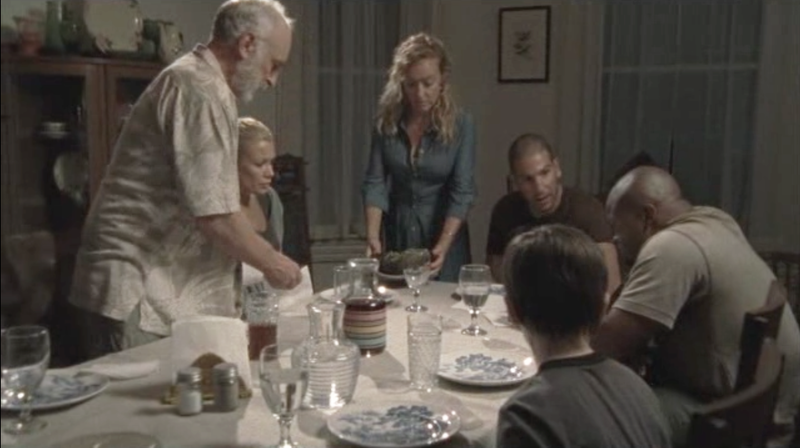 Hershel also insisted that the Group remain unarmed while on his land. 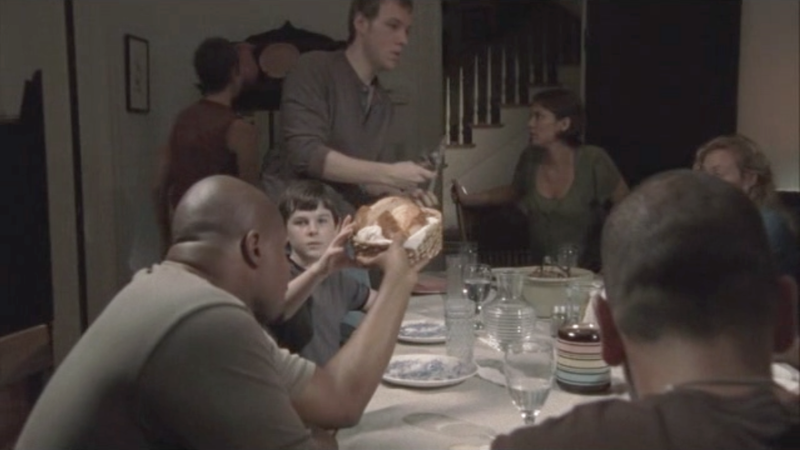 The reason for Hershel's stand-offish behavior became all too clear. He had been keeping his infected wife, stepson and neighbors locked in his barn. He believed that just as with past plagues, a cure would be developed. When he learned the truth, he was devastated. But his daughters still needed him desperately so Hershel soon rallied. 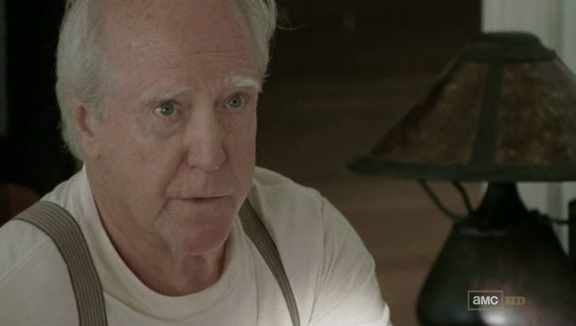 Though he had seemed stubborn and unyielding, Hershel soon proved how adaptable he really was. He quickly regained his wits after the bodies of his late wife and stepson were destroyed. He also realized that if his family were to survive, the Group had to move into the homestead. The old world was gone and there was strength in numbers. The Greene farm that has stood for 160 years had to adapt or it would fall. 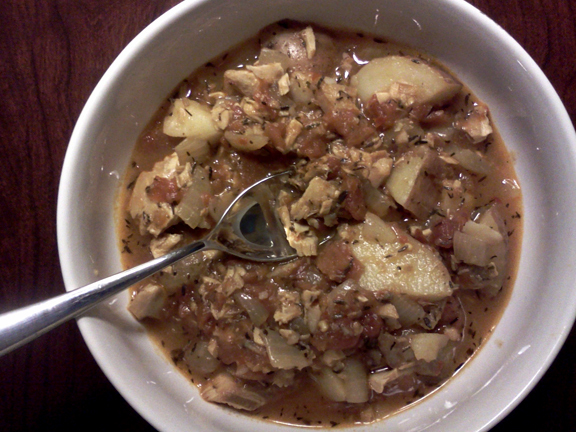 It is in recognition of Hershel Greene and his steadfast ways that the WDSCB presents Pine Bark Stew. Popular in Georgia since the 18th century, Pine Bark Stew was likely named for the small tender roots of the pine tree that were originally used to season the dish. Though it may appear uninteresting, the depth of flavor will surprise. Much like Hershel Greene there is more here than meets the eye. In a large Dutch oven, or soup pot, warm a tablespoon of oil or shortening over medium-low heat or coals. Add onions and cook, stirring often until softened (about 5 minutes). Add potatoes and cook lightly for another 5 minutes. Season with the cayenne, thyme, salt and black pepper. Stir in fish stock. 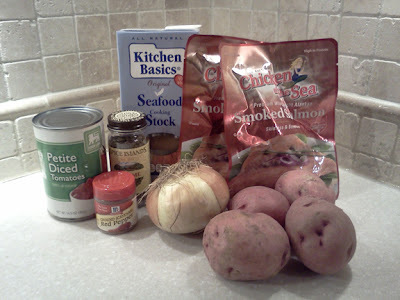 Cover and simmer lightly for 10-15 minutes more or until potatoes are soft but not crumbling. Stir in diced tomatoes. Carefully add smoked salmon and stir gently to combine; breaking up fish into smaller bites (but not allowing it to disintegrate into tiny flakes). Simmer just enough to heat thorough (the fish is already "cooked" by the smoking process). Serve immediately. Lori awakens in Maggie's wrecked car to see Walkers trying to get at her through the broken windows. She uses a flashlight to dispatch one and manages to shoot the other. Back at Hatland's bar, more men from another Survivor Group arrive in search of Dave and Tony. 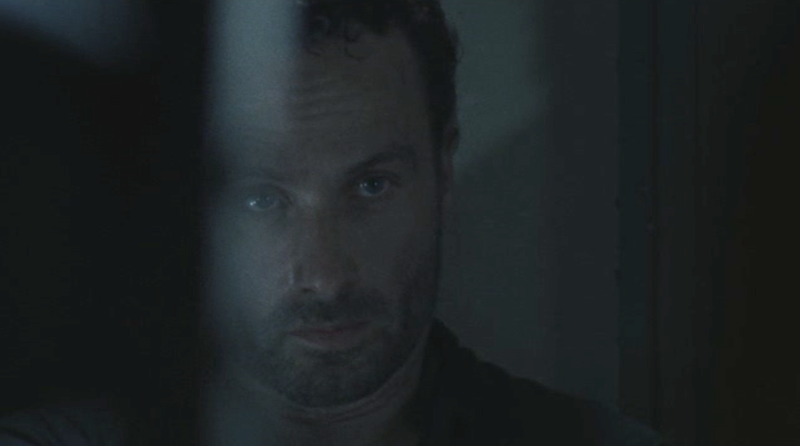 Rick, Glenn and Hershel are trapped inside and the situation quickly develops into a standoff. Rick is forced to attempt to negotiate with the men as they surround Hatland's. 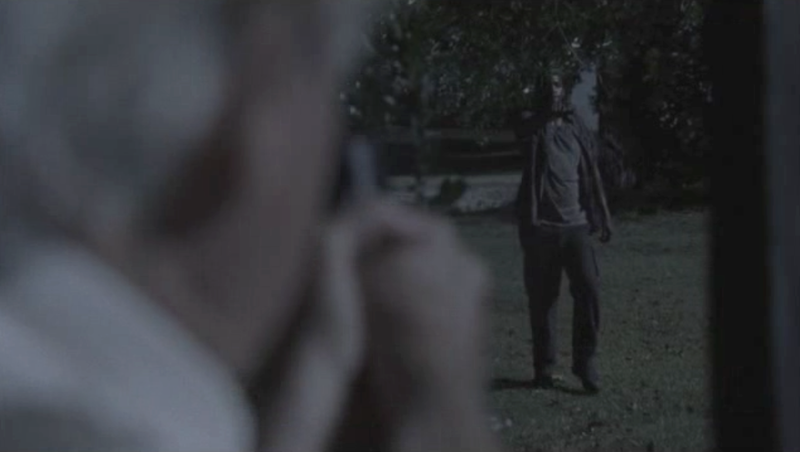 Hershel proves his value in a fight and wounds one of the men with a single shot. 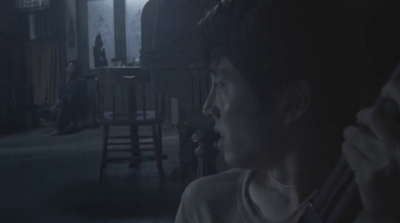 In the firefight, the normally stalwart Glenn suddenly panics and freezes. 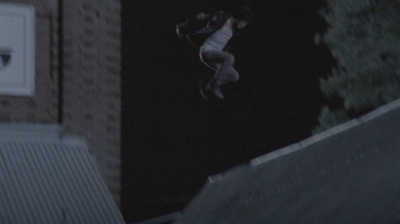 As the men abandon their injured comrade; one jumps from the roof in an attempt to flee. His leg is impaled on a fence during the attempt and he is left for dead by his "friend." Rick yanks the young man's leg free as Walkers bear down on them and the four of them barely escape with their lives. At the farm, Dale, Shane, Andrea and Carl sit down to dinner with the Greene family. Shane realizes that Lori is missing. 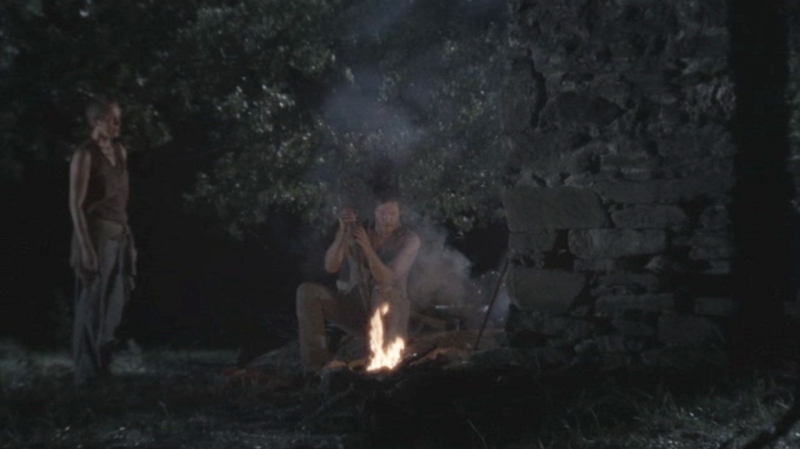 Carol goes out to question Daryl on Lori's whereabouts and begs him not to pull away from the Group. 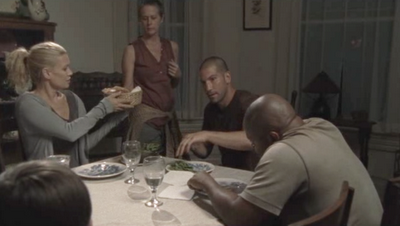 She tells Shane that Lori has likely gone into town herself. Shane leaves immediately to go find her and soon finds Lori walking away from the wreckage of the car. She initially refuses to return to the farm; wanting instead to find Rick. Shane lies and says that the others have already returned in order to convince her to come with him. When they make it back to the farm, he inadvertently reveals her pregnancy and the Group is shocked. With the Group separated and unable to take further action in the darkness, they would have sat down to dinner again. Butter Bean Salad and Pan Fried Tomatoes would be a frugal meal. The Group was already looking ahead to the fall and winter. Making the most of their pantry supplies would be critical. 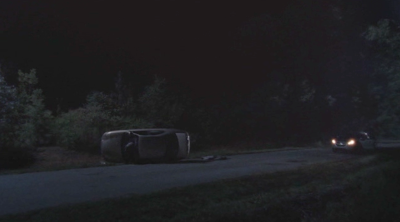 And when the dead rise; don't let Lori drive your car. In a large Dutch oven, heat the oil over medium-low heat or medium-low embers from campfire. 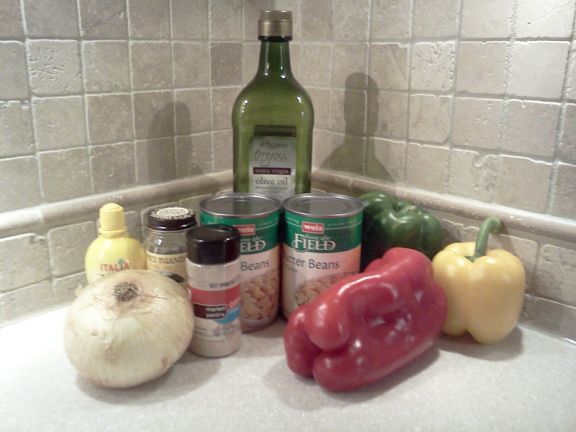 Add onions, and peppers. Cook slowly for 10 minutes stirring frequently. Stir in beans, cumin, garlic and salt. Add lemon juice and stir well. Remove from heat. Allow to cool slightly and serve with Pan Fried Tomatoes. Mix together basil, rosemary, garlic, salt and pepper. Mix in 2 Tbsp. Olive oil to make a paste. Cut tomatoes in half. Spread paste on cut sides of each tomato half. Heat remaining olive oil in a Dutch oven over low heat or low-heat embers from campfire. 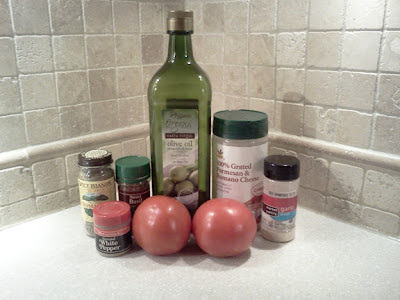 Place tomatoes herb-side down and cook on medium-low heat for 6 minutes. Tomatoes should not be allowed to cook until they collapse. They should just be slightly soft. Remove from heat and sprinkle with cheese. 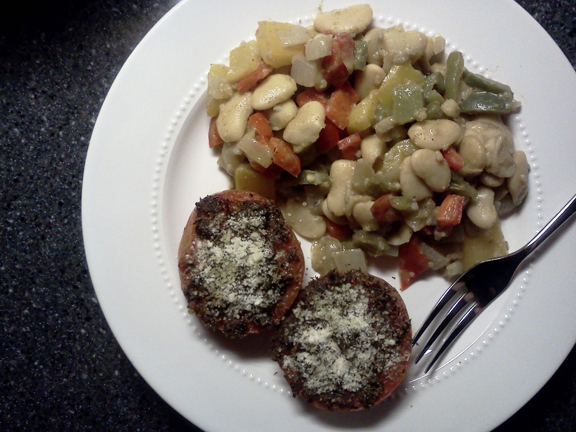 Serve with Butter Bean Salad. When Rick Grimes was faced with his darkest hour, (hiding in the belly of an abandoned Army tank); it was the voice of a young man named Glenn that led him out and ultimately saved his life. When the Group needed supplies, it was Glenn who volunteered to lead them into Atlanta. When the Group decided to return to Atlanta to retrieve Merle Dixon, it was Glenn who took them back in. 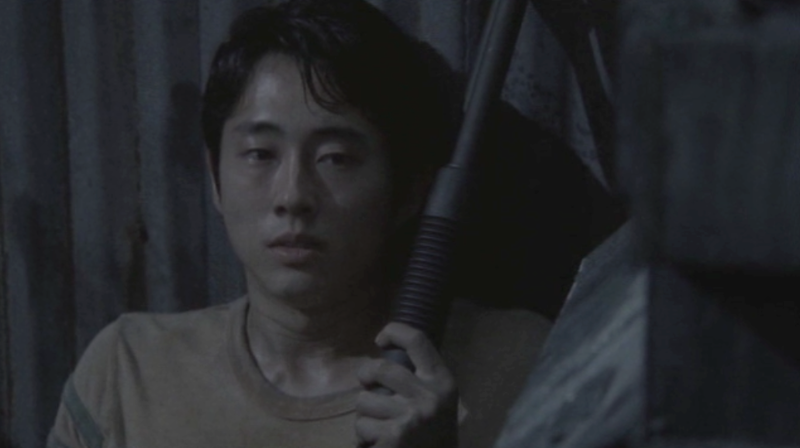 It was Glenn's willingness to help everyone that convinced Rick to return for Glenn himself when he was kidnapped by a gang. As Hershel Greene was treating Carl's gunshot wound, it was Glenn who took the ailing T-Dog to be treated also. His arrival at the Greene farm had an immediate impact on Maggie. Glenn's generous spirit and bravery in risking life and limb for his friends impressed her. Later, Lori entrusted him alone with the knowledge of her pregnancy. 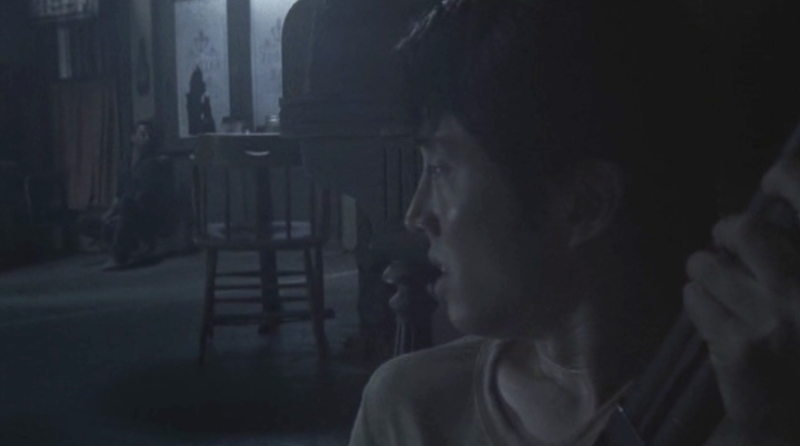 Glenn's eventual discovery of the Walkers contained in the barn started the chain of events that lead to the Group finally getting closure with Sophia's loss. Hershel eventually came to approve of Glenn's relationship with his daughter. 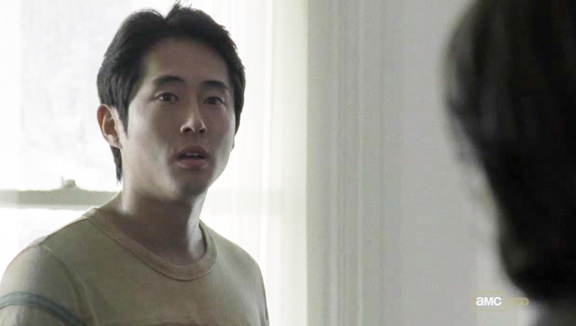 He asked where Glenn's family originally came from. After Glenn replied "Korea," Hershel reminded him to "never forget that immigrants built this country." It is with that wise reminder that the WDSCB presents Mul Naeng Myun in recognition of Glenn; the critical member of the Group who can always stay cool under pressure. 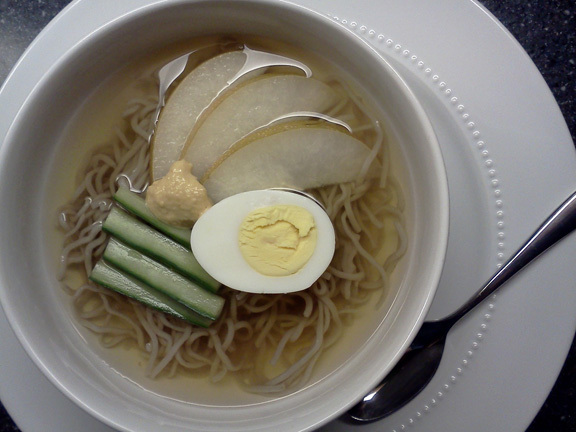 This adaptation of the traditional Korean cold noodle dish contains buckwheat noodles and Asian pears. Regular pasta can be substituted but do make the effort to scavenge buckwheat noodles for your Zombie Apocalypse pantry. 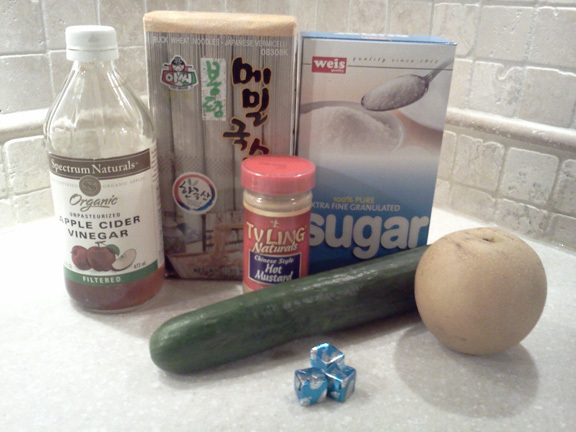 Although Asian pears are native to Asia, they are now grown in the United States. If you cannot find an orchard to scavenge from; you may substitute a sliced apple instead. The combination of cold noodles and tangy broth make this dish perfect when you want to stay cool. Just like Glenn. MIx bouillon with 2 cups of hot water. Let sit until it dissolves. Add the last cup of water and let cool. Add sugar, vinegar and mustard. Mix well. Boil buckwheat noodles according to package directions. Drain and rinse well with cool water in a colander. Divide noodles into two bowls. Ladle cooled broth over noodles carefully. Top with sliced Asian Pear, cucumber, and an egg half. Top with an additional tiny dollop of mustard if desired. Serve immediately.